The negative mail has been flying fast and furious in District 18. How accurate is it? 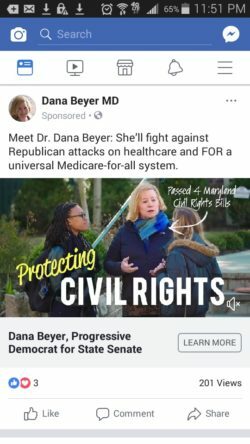 Let’s start with Dana Beyer’s attacks on Del. Jeff Waldstreicher. She opened with a clever mail piece playing on Where’s Waldo? entitled Where’s Waldstreicher? that went after Jeff’s attendance record. Specifically, it pointed out that Jeff has missed far more county delegation votes than any other delegate and also missed a lot of committee votes in 2015. Additionally, Jeff has convened the special committee on drug and alcohol abuse only once since 2011. Are these claims by Dana Beyer about Jeff Waldstreicher accurate? Yes. The quotes are not taken out of context and Jeff has indeed cancelled several campaign appearances on short notice for a variety of reasons. This is a very effective negative advertisement. Going after an incumbent for missing a lot of important votes and being afraid to meet his constituents is utterly legitimate. It directly undermines Jeff’s claim to be a progressive champion since he misses important votes and seems to be doing his best to avoid answering questions from constituents on issues in public settings. Jeff has not responded publicly. However, he has paid for neighbor letters to go out claiming that the attack on his attendance record is false. Similarly, he has told constituents one-on-one that it’s not true. However, the letter cherry picks his committee attendance in a different year and doesn’t even discuss his frequent absences from delegation meetings. So Jeff’s claims that Dana’s criticisms are false are deceptive and untrue. What about Jeff’s attack on Dana? After issuing statements in the past saying “when they go low, we go high” and paying for neighbor letters than attack Dana’s campaign as negative, Jeff has decided to close out his campaign with a very negative mail piece that castigates Dana for criticizing President Barack Obama. How accurate are Jeff’s negative attacks on Dana? Completely. They are accurate quotes that detail Dana’s sharp criticism from the left of the Affordable Care Act, a.k.a. Obamacare. Some might point out that the quotes that Jeff uses are very old. Indeed, they are from 2009 and 2012. But that doesn’t render them untrue. Moreover, as in the case of Dana’s attack on Jeff, he seems to have captured something important here. While Dana supporters would likely portray her statements as a trenchant progressive critique, they come across as almost limitless in arrogance. Dana blithely sets aside political realities that limited the nature of the health care reform bill and seemingly negates that Obama achieved a long-time Democratic dream. It communicates the sense that she really understands these issues better and clearly would have handled this challenge better than the President. The piece captures the utter certitude that can be useful to a surgeon handling a crisis in the operating room but less appealing in a junior politician who needs to work with colleagues who will not have patience for lectures of this sort. This same tone can also come across as talking down rather than listening to constituents. I have heard some local residents decrying the negative tone of one or the other campaign. However, these are reasonable lines of attack. They are not made up or spurious allegations and neither distorts the other’s record. You’re free not to like it but the claims all seem reasonable enough to me. Today, I take a look at Dana Beyer, candidate for Senate in District 18. She’s moved from being a very successful eye surgeon to a persistent, albeit less successful, candidate. Will her fourth election seeking legislative office in District 18 prove the charm? In that short time, Dana had developed an extremely successful practice. According to court documents, she earned $1.65 million in her final year. That’s the equivalent of at least $3.18 million in 2018 dollars. If just one year’s income had been invested in the S&P 500 in January 1991, that would now be worth over $2 million, and over $22 million if dividends had been reinvested. Dana explained to me that it was not feasible to return to medicine because skills atrophy and her medical subspecialty had moved along by the time she had completed her gender transition. Due to her success in what was clearly a brilliant, short career as an eye surgeon, she was also in the unusual and enviable position of not needing to work. The only full-time emplyment that Dana has held since leaving medicine was as Councilmember Duchy Trachtenberg’s aide when Duchy served one term on the Council from 2006 until she was defeated for reelection in 2010. During that time, Dana took a prominent role in moving forward the County’s law against discrimination based on gender identity. Otherwise, Dana says she has focused on social justice activism, particularly for transgender rights. Dana has also relentlessly pursued state legislative office in District 18. She came in fifth in the delegate primary in 2006, receiving 5128 votes or 1217 less than Jeff Waldstreicher, her current opponent. In 2010, she tried again and came in fourth with 5450 votes, 1306 fewer than Al Carr who won an appointment that Dana also sought in 2007. Running an aggressive campaign against incumbent Sen. Rich Madaleno in 2014, she took 5238 votes, or 2082 fewer than the incumbent. Now, she and Jeff Waldstreicher are facing off for the Senate vacancy caused by Madaleno’s entry into the gubernatorial race. 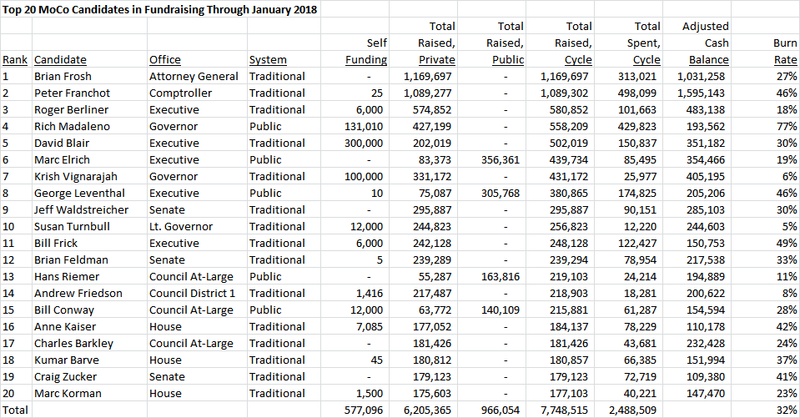 It’s on track to be the most expensive race this year thanks to Waldstreicher’s fundraising prowess and Beyer’s willingness and ability to heavily self-finance. Beyer has spent over $900,000 pursuing her legislative dream. Based on her past spending pattern, she is set to exceed $1 million by the time this race is over. She has spent more and more with each new election cycle with the total amount rising from $116K in 2006 to $147K in 2010, and $333K in 2014. She has already spent $308K on her current bid. At this point, Beyer has now spent longer running for office than she did as practicing eye surgeon. This record juxtaposes somewhat uneasily against her heavy emphasis on her knowledge as a physician and, more specifically, a mail piece that advertises work she did as a physician decades ago. 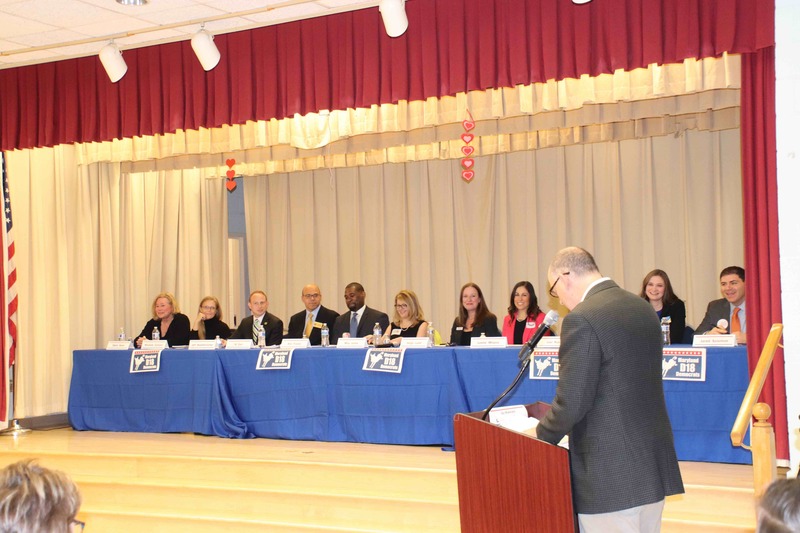 Waldstreicher Misleads on Endorsements. Again. Unfortunately, these quotes are from the Post’s endorsement of Waldstreicher for reelection as delegate four years ago. I suppose one could argue that the word “reelection” indicates that it’s old, as Jeff is not running for reelection but the Senate. But it’s easy to miss that clue and fail to make the connection. Waldstreicher and frequent state legislative candidate Dana Beyer, his main opponent for the Senate seat, both ran for the House of Delegates in 2006 and 2010. The Post endorsed neither in the 2006 primary. 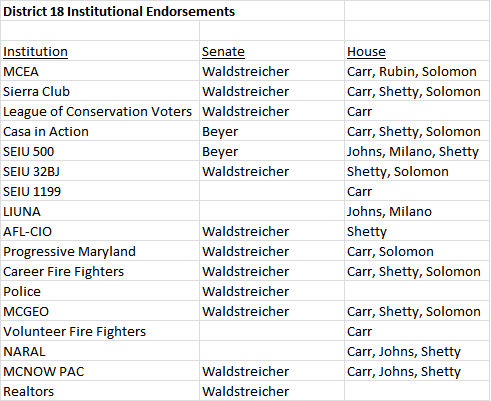 In the more recent 2010 primary, they endorsed Beyer but not Waldstreicher even though he was the incumbent. 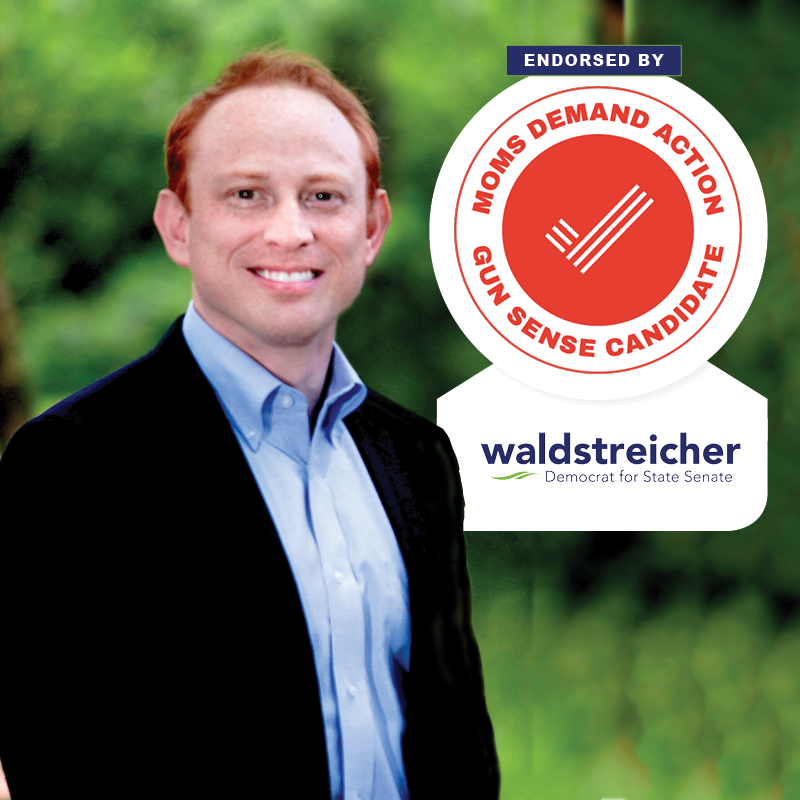 [B]eing a Gun Sense Candidate should not be considered a formal endorsement from Everytown for Gun Safety Action Fund and multiple candidates running in the same race may receive the Moms Demand Action Gun Sense Candidate distinction. Like all certified gun sense candidates, including Dana Beyer, he is free to use the logo but not to claim an endorsement. However, Jeff’s campaign intentionally modified the logo to turn the Moms Demand Action imprimatur into an endorsement. If you want to see an example of how to properly use the logo, check out Mila Johns’ delegate campaign webpage. This isn’t the first time that Jeff has misled regarding endorsements. Previously, I noted that he made it easy for voters, including me, to think that he had been endorsed by Rep. Jamie Raskin even though that was not the case. I don’t know why the frontrunner who collected a nice passel of genuine endorsements needs to give the false impression that he has endorsements that he doesn’t. It just feeds an impression of someone who is less than wholly trustworthy. I should mention that I learned about Jeff’s Facebook page from an anonymous tip. I asked Dana Beyer directly and she replied that “I did not” send it, though did not respond to a follow-up asking if someone from her campaign had sent it. Similarly, I asked Jeff for comment as well as a copy of his endorsement letter from Moms Demand Action and have not yet heard from him. You do the math. 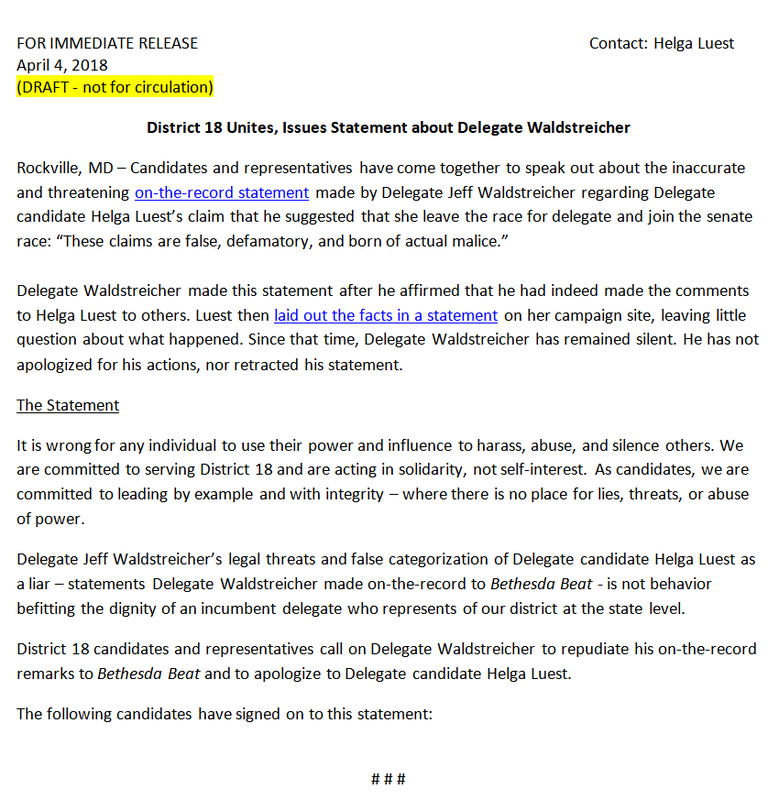 District 18 Delegate candidate Helga Luest, who has accused Delegate Jeff Waldstreicher of asking her to switch races to benefit his Senate candidacy, has circulated a statement against him to other candidates in the district requesting that they sign it. The deadline she set passed and after the statement leaked to the press, the effort collapsed. 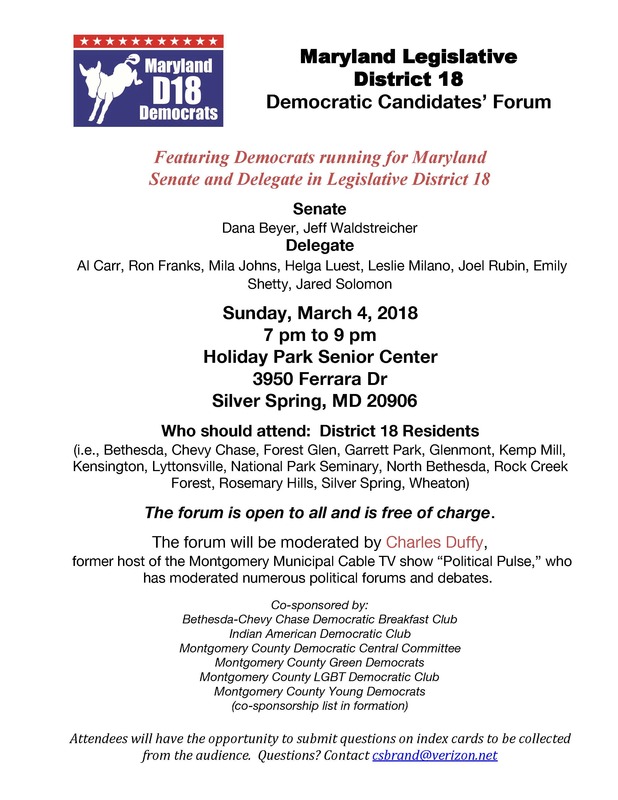 Luest then circulated the statement below to the other candidates for Senate and House in District 18, including the two running against Waldstreicher, and asked them to sign it. We reprint Luest’s proposed statement and her transmittal email below (with the private email addresses of recipients redacted). Fellow House candidate Joel Rubin pushed back, writing this email to Luest and the other candidates. Dear Helga – After careful consideration, I’ve decided to neither provide edits to nor sign on to this letter. I have spent my entire life as a son, brother, grandson, husband, father, nephew, and son-in-law to powerful, smart, amazing women. Professionally, I have dedicated years of my public sector service to programs that advance women’s rights as a Peace Corps Volunteer in Latin America and to women’s economic advancement in the Middle East as a State Department officer. And politically, I have supported women candidates for office both financially and with advice and support. In fact, I was recently endorsed for State Delegate by Congresswoman Jan Schakowsky – the co-chair of the bipartisan Congressional Caucus for Women’s Issues. This is why I’m not signing the letter. Because what I have learned from all these women in my life – not to be bullied – empowers me to say no. Yet that is precisely how you are approaching this letter. This letter is about an issue that you have with another candidate. You have made your concerns about his behavior clear publicly. And you have gotten significant press coverage about this issue. It is not hidden from public scrutiny. In addition, I have privately spoken with you to express my admiration for your willingness to stand up for yourself on an issue that you find of ethical importance. Yet instead of making this your own fight, you’re now attempting to re-frame this issue as one about women versus men. And you made it clear in your outreach to me that if I didn’t sign the letter, I would be portrayed as anti-woman. This type of approach undermines your claims of principled behavior. Not only are you using bullying tactics, but you are also engaging in guilt by association and the potential smearing of my reputation because I may not support your personal position expressed in this letter. I think it’s wrong that someone whom I barely know and met just a couple of months ago on the campaign trail believes that they have the right to define for me what it means to be a supporter of women. My personal and professional track record speaks for itself and runs counter to these claims. It therefore seems that this letter is more about politics than about principle. It appears to be an attempt to leverage the #MeToo movement for personal political benefit. And that is a real shame. I prefer to stick to principle when it comes to advancing women’s rights. It is time to build alliances between women and the men who are already on their side. After Rubin’s email was sent, the statement leaked to the press and Luest’s deadline on Wednesday at 5 PM passed with no consensus. Then the discussion ended. We make no judgment on whether Luest’s account or Waldstreicher’s is closer to the truth. But we understand why Luest’s statement failed to get traction. In District 18, the House and Senate contests are fundamentally different. The House race is a popularity contest. Whichever three candidates have the most appeal for voters will win. Controversy does not facilitate victory. The Senate race is going to be a war. At some point, Beyer and Waldstreicher – neither of whom are the other’s devoted fan – will start launching live fire. Only the strongest will survive. Why would the House candidates want to be in the middle of that? Here is a prediction: this is not the last time we will hear of this. 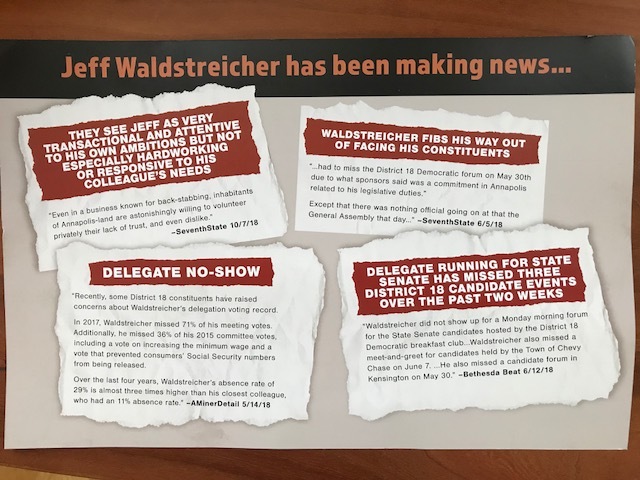 As Waldstreicher is a three-term House incumbent, he has the advantages of name recognition, constituent service, community relationships and endorsements over Beyer. Since the two have virtually identical positions on issues, Beyer will seek an edge to make the case that she is a better choice than Waldstreicher despite his twelve years of service. Luest’s story will therefore live on – in Dana Beyer’s mail. 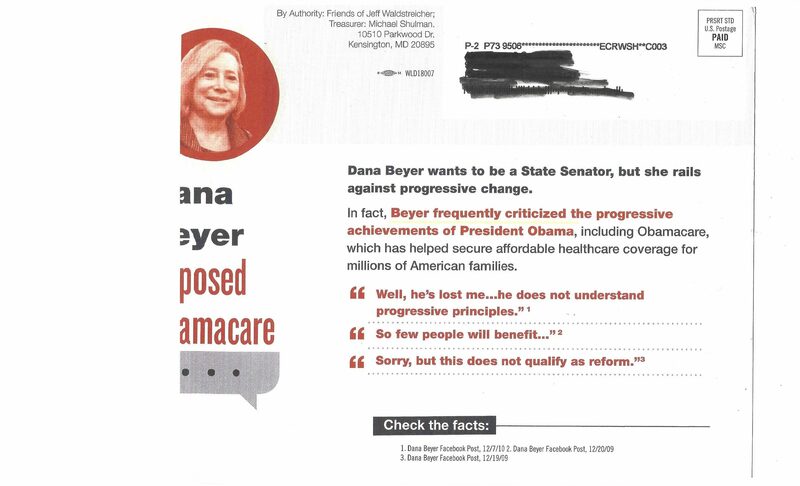 Unelected Beyer Over Claims, Saying She “Passed” Legislation. 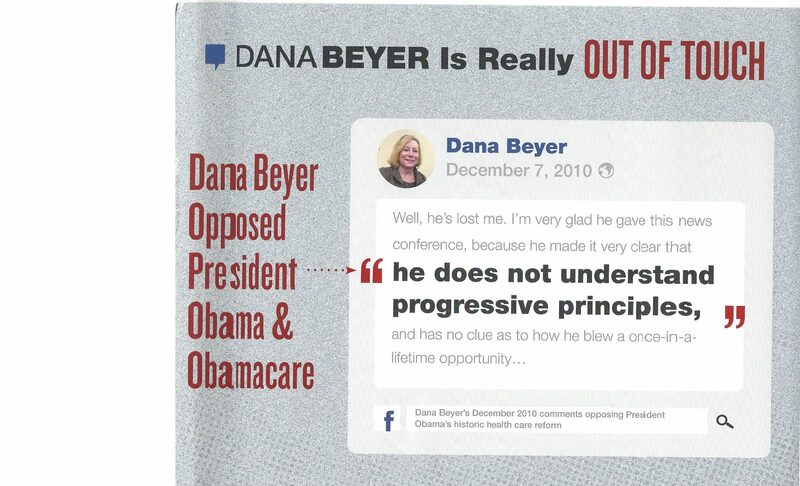 Dana Beyer, candidate for the open District 18 Senate seat, is not the first in this election season to claim that they “passed” legislation despite not serving in the legislature. People who don’t serve in legislative bodies do not pass bills. Heck, even individual legislators don’t pass bills. No doubt she is referring at least partly to the anti-transgender discrimination bills passed by Montgomery County and the General Assembly. During the former, she was a legislative aide to Councilmember Duchy Trachtenberg. In these situations, the well-understand rule is that credit accrues to the legislator–not the aide. It would fine if Beyer would simply claim that she was proud to have worked on the bill instead of over claiming that she “passed” it. 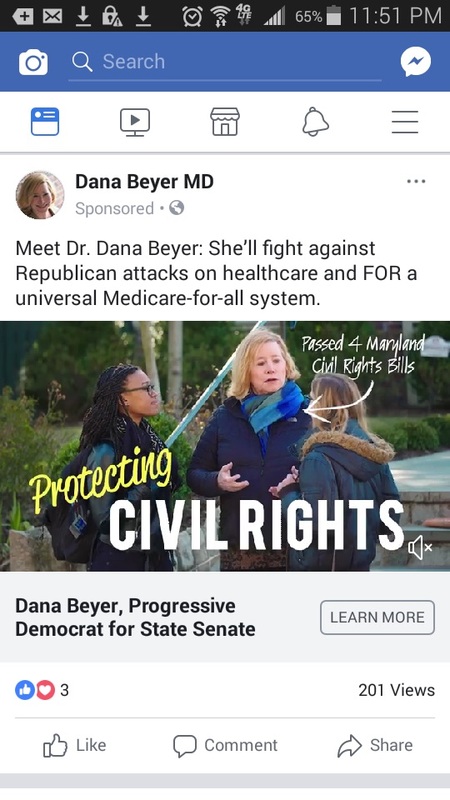 Beyer was the Executive Director of Gender Rights Maryland during the battle for the state anti-discrimination bill but incumbent Sen. Rich Madaleno was the chief sponsor of the state anti-discrimination legislation and indefatigably fought for it for many years. U.S. Rep. Jamie Raskin, then a state senator, was also strongly supportive in the General Assembly. While Beyer lobbied for the bill, she also stormed out of a hearing because she was not on the first panel to testify. Gender Rights Maryland also chose not participate in the broad coalition organized by Equality Maryland Executive Director Carrie Evans, who also spent many years working hard on the bill. In short, non-legislators don’t pass bills and these fights are invariably team efforts. There are ways for candidates to advertise their past public service efforts and even gild the lily a wee bit without claiming you “passed” bills when not in elective office. District 18 Delegate Candidate Helga Luest’s statement that Del. Jeff Waldstreicher tried to lure her into the Senate race in order to aid his own move from the House of Delegates to the Senate has become quite the contretemps in District 18. 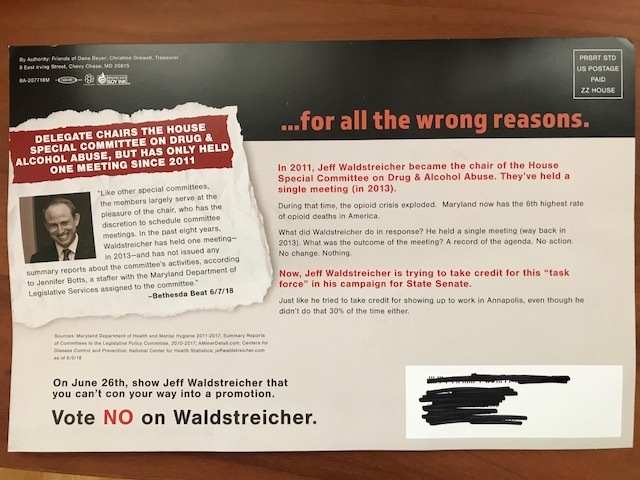 These claims are false, defamatory, and born of actual malice,” Waldstreicher, who has served as a delegate since 2007, said in the statement. “When they go low, I go high—standing up for our community’s progressive values, leading the fight for $15 minimum wage, investing in our schools and resisting the Trump administration at every turn. Jeff ought to be a near lock for this seat. He’s a three-term delegate and has consistently garnered more votes than his opponent, regular state legislative candidate Dana Beyer, as Adam Pagnucco has pointed out. He hasn’t strongly alienated any constituencies, which should make it hard for her to gain traction. But he seems to be doing his level best to turn this into a competitive race. Even leaving aside Helga’s claims, his public statement sounds like what Melania would say if she was a red-headed attorney. Rather than issuing a standard denial or explaining the situation, it looks like Jeff is thinking like an attorney who has managed to turn Michelle Obama’s inspiring words into political pablum. Moreover, when an attorney uses legalistic words like “defamatory” and “actual malice,” it look like he’s hinting at a lawsuit in an effort to get Helga to stop talking. It never looks good when the optics are of a politician trying to silence someone. In the current climate, a male candidate trying to get a female candidate to stop talking looks even worse. Of course, if he did file a lawsuit that would really torch his political ambition. Jeff’s evasiveness and efforts to kill the story also haven’t helped. Jeff’s silence and avoidance of comment on any remotely controversial issue at last Sunday’s debate–he literally did not speak for the first 75 minutes–also reinforce the perception of an overly political approach. Dana Bayer felt “it was demeaning” that Jeff suggested she run on a slate with him for delegate instead of competing for the Senate seat. That, however, seems like normal politics and a good offer. On the other hand, an effort by Jeff to get Helga to run for the Senate to help him out, would appear much more manipulative and skeezy. Voters might well judge it less kindly, though I’m not sure if they will know or care. I trust her and believe the story. I find it disturbing that Jeff would so crassly ask anyone to sacrifice themselves for his sake, let alone a woman. As if her commitment to public service was inconsequential, and beneath his concern. Except this is not sexual harassment but political manipulation. Dana would also gain more if she stayed in the background rather than appearing all too eager to garner political advantage. The idea that one always trusts women over men is also problematic. I have never seen nor heard any stories of Jeff behaving remotely sexually inappropriately. Frankly, it would surprise me greatly. I should also emphasize that this is not what Helga says happened, though she sees his actions through the broader lens of misogyny faced by women. Notwithstanding the bad optics of Jeff declaring Helga’s post as “defamatory” and “born of actual malice,” I see this situation more as maladroit machinations. Helga’s allegations could be completely true but not so much about gender as the political maneuvering referenced in the Bethesda Beat headline. To the extent that Jeff is willing to engage in these too-clever-by-half political games, I think he’d just as easily ask a man if he thought that was the good play. If he’s guilty of anything here, it’s political malpractice and a self-inflicted wound, as all of this seems rather unnecessary for him to win. At the same time, Jeff’s “totally false” statement had at least one glaring weakness and Helga has not hesitated to point it out. 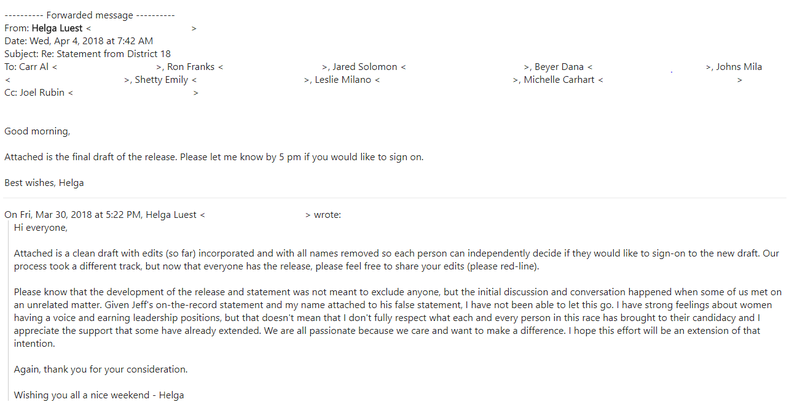 Specifically, they clearly did meet, as Helga has highlighted in her reply to Jeff’s public statement. Helga mentions accurately that she told me about the story before she published her Facebook. For a variety of reasons, I didn’t feel comfortable publishing it. She did not mention that I contacted her when I decided not to publish the story. I’m glad Bethesda Beat’s Andrew Metcalf covered this story instead of me. Frankly, I’m not a professional reporter and he did a better job than me of getting straight up on the record accounts.